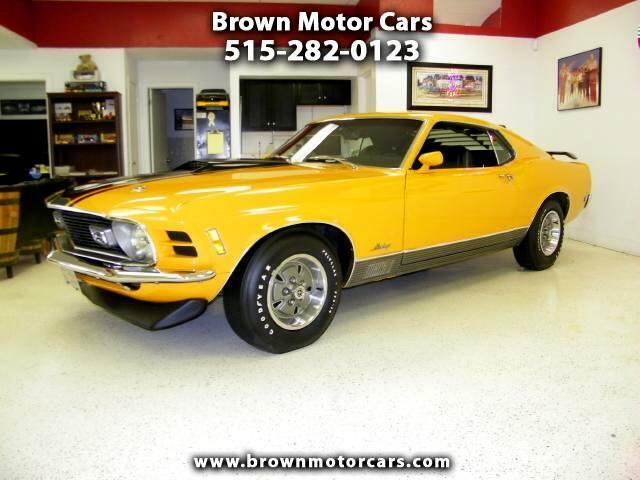 Heres your chance to own a piece of American History and it comes in the form of this 1970 Ford Mustang Mach 1 with ONLY 14K MILES! That's correct this Mach 1 has 14k Original miles!You won't find very many cars that are in as pristine condition as this car. It comes in stunning Grabber Orange with Black racing stripes over Black Vinyl interior that is as clean as the day it left the showroom floor! You won't find a flaw as you walk around this beautiful car! It has the period correct GoodYear Poly Glass tires that are brand new! And under the hood is the factory 351 Cleveland V-8($48 option) that runs as good as the rest of the car looks! Also in the motor compartment you will find all the original stickers and badgings, including the factory inspection stickers. Comes equipped with an automatic Select-Shift FMX transmission that shifts very smooth! Other options include AM/FM Radio($214 option, the most expensive option on the car), power front disc brakes, power steering, 2-in-1 Seat-Rear sport deck, sport slats, front and rear spoiler, fender moldings, and trunk and map lights! We have the original window sticker for the car and also have a Mustang Magazine that this car was featured in! This is an all original SURVIVOR car thats is immaculate! There are not enough words to descibe this gorgeous car so stop in and take a look at it today and you will leave with a true piece of history that will only continue to Appreciate in value! 515-282-0123.